Hello mommies out there! I know one of the main things that you provide to your babies and kids is their utmost safety. I am not a parent yet but I had the opportunity to take care of my nieces and nephews when they are still babies. Let me share this funny story. One time I took my nephew one morning for a leisurely walk in the nearby park and he was on his stroller. We had fun coz I let him run at the big football field but it was cut off when the rain suddenly fell. I hurriedly get him and strapped him on his stroller but unfortunately it has no hood so we both got wet. If you only saw how I carried him and push his stroller to the nearest shade you’d laugh at me hahaha. 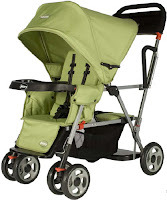 I wish it was a joovy caboose stroller (like the one in the photo) bec. for sure I will not have a hard time pushing him. Have you used Joovy Caboose strollers?